Christina Buscemi is excited to begin her fourth year teaching Pre-K for All at Divine Wisdom Catholic Academy. She has a Bachelors in Primary Education and English from Roehampton University in London and a Masters in Early Childhood Education and Special Education from Touro College. Over the past 16 years Mrs. Buscemi has taught early childhood programs in public and parochial schools both in London and New York. 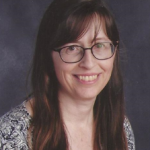 She enjoys teaching integrated themes through child-centered learning experiences to help young children on their journey to confidence and independence. When not at school, Mrs. Buscemi loves to travel with her family and find out about new places, near and far!